YOSHIHIKO NODA, Prime Minister of Japan, said “this has been a year of extraordinary challenges.” A little over six months ago, following a major earthquake, more than 20,000 Japanese people were killed or are still missing, and 40,000 more were forced to evacuate. He had been deeply moved by the feelings of compassion shown by people the world over for the people of Japan, he said, recounting several individual stories of kindness and sympathy. Since the 11 March earthquake, the “sounds of recovery” had been echoing through the affected Tohoku region of Japan, he said. The infrastructure and economies of the areas, which had been “washed away” by the quake and the ensuing tsunami, were now being restored. Moving forward, Japan would focus on moving up the existing target period to achieve “cold shutdown status” at the Fukushima Daiichi Nuclear Power Station by the end of the year. Meanwhile, such actions as removing debris and recreating livelihoods in the affected areas were still needed. Recent changes in the Middle East and North Africa had been brought about by “the aggregate consciousness of all individuals who have awoken”, he continued. In that light, “we have never felt more strongly the significance of ensuring human security.” Japan would work hand in hand with all world leaders to make a substantive contribution to address world challenges and ensure a brighter future for all humanity, he said. It had a long history of assisting developing nations through human resource development and nation-building efforts. It would continue to support such development through official development assistance (ODA). “We must not let the current global economic uncertainty and financial unrest hamper the efforts of the international community towards growth,” he said, calling on States to instead create “harmony out of the current chaos”. Japan would press ahead with its targets for restoring fiscal sustainability, including a full-fledged recovery from the earthquake. It was also important that trade activities not be disturbed by the excessive currency volatility, he added, stressing Japan’s commitment to green growth, energy saving and the clean use of fossil fuels, among other activities. By next year, Japan would create a new strategy and plan for its mid- to long-term energy composition. It would also contribute to the growth of the global economy and for discussions leading up to Rio+20. “The first lesson from Japan’s recent tragedy is the importance of international cooperation in disaster recovery,” he said. Japan was prepared to share with the world its experiences, and would host an international conference in the disaster-stricken Tohoku region next year. It also proposed to host the Third World Conference on Disaster Reduction in 2015. 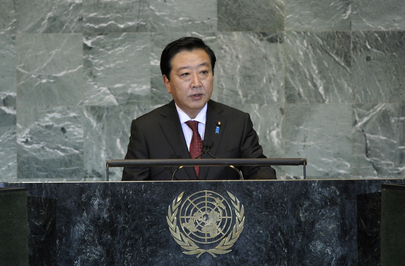 Japan also hoped to share its acquired knowledge and experience in the field of nuclear safety, he said. Following the nuclear accident that came in the wake of the 2011 earthquake, Japan had implemented emergency safety measures and had further strengthened its resolve to contribute positively to the reinforcement of global nuclear power safety, drawing on the experience of its accident. Next year, it would co-host an international conference with the International Atomic Energy Agency (IAEA) to share results of the overall assessment of the accident in comprehensive detail, along with other follow-up actions. He also described Japan’s efforts to combat other global threats, including piracy off the coast of Somalia and terrorist activities, such as the recent assassination of Mr. Rabbani, Chairman of the High Peace Council in Afghanistan. It continued to contribute to the efforts of peacekeeping missions in fragile or conflict-prone States, he added. Japan continued to urge the Democratic People’s Republic of Korea to take concrete actions toward the resolution of its “nuclear and missile issues”, which posed a threat to the entire international community. It also maintained its contribution to the attainment of the Millennium Development Goals, focusing on health and education. It would also host the Fifth Tokyo International Conference on International Development in 2013, among other development and humanitarian activities. The last commitment he wished to mention was Japan’s support of reform and democratization efforts in the Middle East and North Africa, which projects for infrastructure building and development, as well as electoral assistance in Tunisia and Egypt. After the 11 March earthquake, he said, “I strongly felt the magnificence of a society in which each individual undertakes action in an orderly manner, a society in which people help each other”. He also believed in the strength of the Japanese people, he said, “which comes to the fore most prominently in times of crisis.” He was certain that such resilience would be the very source of Japan’s future contribution to the international community, he concluded.